Many architectural firms have built solid reputations by taking bold, innovative approaches to complex challenges in the built environment, yet few have been at it longer than Boston-based Shepley Bulfinch, a national practice that has been reinventing the status quo for over 150 years. The world was first introduced to the firm in 1877 with the consecration of Boston’s Trinity Church, after Shepley Bulfinch founder Henry Hobson Richardson won an 1872 competition to design the structure. Following the Civil War, the country was ready to rebuild but what it also needed was a fresh vision, not just copies of Old-World forms. Richardson, known for reinterpreting European forms and styles, infused the Romanesque tradition with innovative ideas, creating something entirely new in the process: Richardsonian Romanesque architecture. The style was rapidly reflected in new public buildings across the country. The church, now a National Historic Landmark, established a pattern that remains characteristic of Shepley Bulfinch today. Today, Shepley Bulfinch produces forward-thinking buildings across several disciplines including education, libraries, civic and mixed use, but its reputation is perhaps strongest in the healthcare sector. Always top of mind for the firm’s more than 70 architects is wellness in design, or considerations for human health and the impacts that design has on metrics such as occupant physical and emotional wellbeing, productivity, staff retention, recruitment, increased cognitive restoration, creativity and even happiness. 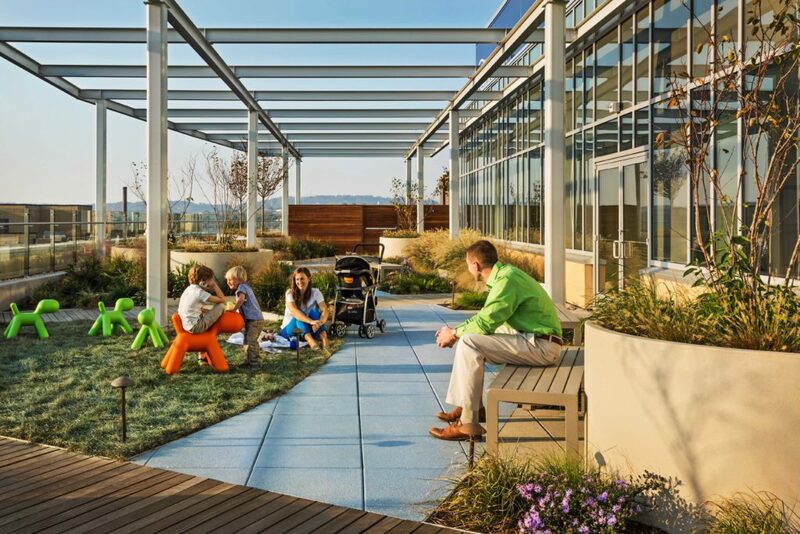 What also sets Shepley Bulfinch apart among the nation’s consistently top-ranked design organizations, according to firm principals, has long been an holistic approach to sustainability; bettering health and wellbeing for both humans and the environment. The firm’s holistic approach is a philosophy that dates back to its first project in 1912, Boston Children’s Hospital (BCH). Shepley Bulfinch architects go beyond conventional sustainability strategies to address issues like safety, healthy food production and access, social justice and diversity. A Sustainability Charter is created for each client, which becomes a document that ultimately acts as a litmus test for success. The charter outlines the vision, goals and measurable metrics to achieve those goals, the specifics of which are then tracked throughout the design and construction process. Today — more than a century after its first project — the firm is again partnering with BCH, ranked as the top pediatric hospital in the country by US News & World Report, on the largest expansion in the hospital’s long history with the new Hale Family Clinical Building, which broke ground in late 2017. At 595,000-square-feet, it will have 150 single-patient rooms, 28,000 square feet of new greenspace and 16 operating rooms. The expansion not only presents Shepley Bulfinch architects with the challenge of designing for the future of pediatric medicine, it also requires a focus on resiliency, so the care facility can operate independently in the case of a catastrophic event. Architects are working with the hospital’s engineering team, life safety, logistics and emergency preparedness groups to develop functional priorities. As part of that process, they created a 40,000-square-foot “cardboard city” simulation to find new ways to improve patient and staff journeys. The Hale Building will not only improve specialized care, it will address increased patient acuity and reimagine a streamlined perioperative platform with flexible and dedicated operating rooms that combine the hospital’s Heart Center services onto a single-floor platform that optimizes the patient experience, according to Shepley Bulfinch principal Uma Ramanathan. Cardiac diagnostic and treatment spaces encourage collaboration while enhancing quality of care, and new green spaces provide tranquil places for patients and families to think, reflect and heal, Ramanathan added.